Best Western Premier® is one of Best Western® Hotels & Resorts’ most exclusive brands, bringing a notably refined and elegant experience to today’s discerning travelers. With 120 locations across the globe and 50 additional Best Western Premiers in the pipeline, the upscale brand is designed for business and leisure travelers seeking first-rate amenities, superior accommodations and exceptional service. Over the past two years, Best Western Hotels & Resorts has refreshed the Best Western Premier breakfast program and in doing so, has earned countless accolades. As the brand’s breakfast satisfaction scores continue to increase each year, with breakfast being a key driver of guest loyalty (known industrywide), Best Western’s PR team sought to secure earned media coverage that would generate widespread recognition across the industry for the company’s leadership in this area. Marketing objectives were to: •	Identify the perfect trade outlet to garner exposure for the breakfast revamp and earn credibility for the company’s efforts as a leader in the space; and •	Position Best Western Premier in this coverage as a leader in hospitality and food and beverage, innovating its offerings to tap into the evolving needs of today’s travelers. The trade media was a focus for this effort because this is where Best Western’s membership base consumes their news, reading about the industry on a frequent basis. It’s important that existing owners continue to see and hear about the Best Western brand, creating a sense of pride amongst the existing membership family. In addition, the trade press is where prospective members are – hotel owners, developers and management companies – making decisions about their future brand relationships. Best Western’s PR team targeted Hotel F&B for a story about the company’s breakfast evolution and how it is driving satisfaction within the Best Western Premier brand. Best Western’s PR team researched the demographics of top national food and beverage trade media outlets, ultimately identifying Hotel F&B as the ideal target outlet for a feature story covering the successful growth of Best Western Premier’s breakfast program. It was determined that this publication, reaching 100,000+ executives within the hotel and F&B industries, would be the perfect vehicle to create excitement around the company’s thought leadership and innovation. The desired key messaging for this story revolved around flexibility, value and guest satisfaction. In seeking out a feature story about Best Western Premier’s unique breakfast model, the PR team sought to create exposure for the brand as a front-runner and innovator in the upscale space. 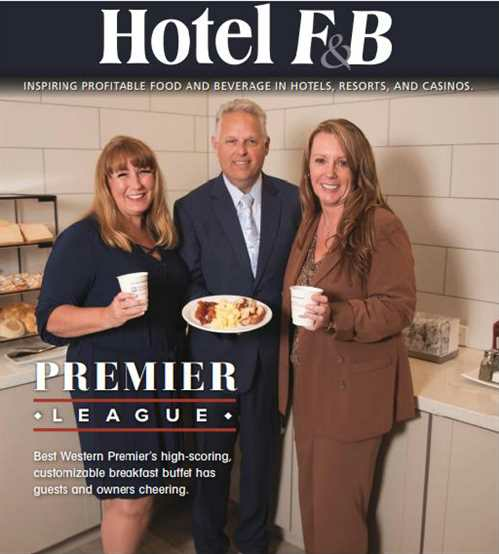 The feature, “Best Western Premier Scores with Robust Breakfast Buffet,” ran in the July issue of Hotel F&B magazine, as well as online at HotelFandB.com. The story provides BW’s brand history, an overview since its refresh and offers insight into its unique management strategy, giving owners the freedom to choose whether to charge or not for their breakfast buffet. The piece opens with, “Within the crowded select- and limited-service category are myriad complimentary breakfast programs, while many upscale brands charge a nominal fee… at the upscale BWP®, owners can choose to charge (or not) for their breakfast buffet, giving them flexibility to maximize their market.” The story highlights the correlation between the model and guest satisfaction, “The overall breakfast satisfaction scores at BWP—combined complimentary and pay—stand at 74.3% for 2017 compared to 70.7% in 2016 and 66.8% in 2015.” Messaging pull-through achieved the exact type of exposure the team was seeking.